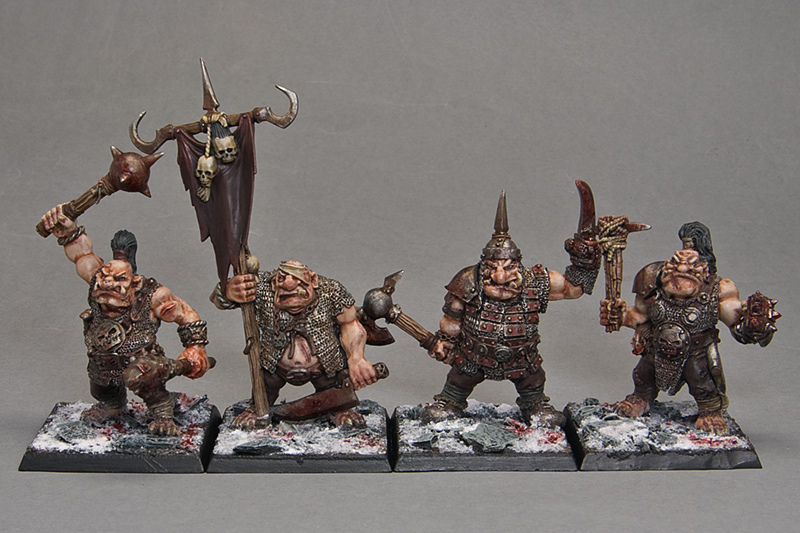 I spent much of the weekend putting the finishes touches to a unit of chaos ogres. These are old metal models, from the early 1990's. I added a couple of plastic components to emphasise the fact they are equipped with additional weapons. I also tried to suggest a Khorne allegiance, with splashes of red armour (and blood of course). And so on to the dreaded first game (newly painted troops always seem to suffer undue attention from the enemy). Lining up against an Empire gunline I had grave concerns for them. Sure enough, one fell to the ground full of lead and cannon balls. As they are frenzied, they have to charge enemy on sight, so it was with some relief that they crashed into a unit of handgunners after a very long sprint across the board (I rolled a 10 for the charge). One of them finally succumbed to his wounds, but the remaining duo made short work of the musketeers. They then turned their attention to a huge unit of spearmen, the prospect of eating 50 speamen was too tempting to worry about odds! The ogre champion picked on the Empire general, gutted him with a swift stroke of his fist spike and tossed his bloodied remains into the snow. Several spearmen joined their leader in a gory pile at the ogres' feet, but eventually the massed ranks proved too much and they were driven off. In the end, killing a unit of handgunners and a few spearmen plus the general was a decent performance under heavy fire, a feat excelled by just one other on the chaos side, but that's a story for another day. I played the Clash of Champions scenario over the weekend. My fledgling chaos champion, Ragnar the Undecided, led his troops into the chaos forest seeking glory. Both he and his rival chaos champion broke off from the combat to search the ogre infested woods (every guardian we rolled turned out to be an ogre). Both were successful and emerged with chaos rewards and magic items! And both armies virtually destroyed each other in the six turns we played (not surprising perhaps as the armies were almost identical and equally destructive). A well fought draw was a good result for the start of what will be a fairly long campaign. The final tally for Ragnar was the acquisition of the Glaive of Putrefaction, and two chaos rewards - Iron hard Skin and Flames of Chaos. For me, this suggests mostly favour from Nurgle, so I decided to paint up the metal Nurgle champion model in preparation for future scenarios. However, after an hour of searching the model could not be found. This means two things - (i) my pile of unpainted minis needs a major tidying up and (ii) Ragnar will have to be constructed from plastic bits instead. 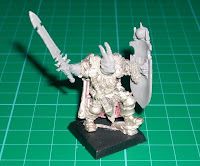 At first I struggled with ideas on how to convert a chaos warrior into a convincing champion, but then I realised that perhaps I was looking at the problem from the wrong angle. Ragnar shall not struggle into battle on foot, but riding on a mighty chaos steed. This got me thinking about Ragnar's retinue. Of course he will have to be accompanied by a unit of chaos knights. A unit of six knights led into battle by Ragnar, making the magical Nurgle number of seven, is the next project in the army. Well, the next construction project, I have a half-painted unit that I am hoping to complete in time for the next scenario. The Favoured of the Gods is a series of linked scenarios, pitching rival chaos champions into bloody combat. Each champion is striving to impress the chaos gods on the battlefield, hoping to earn favour in their eyes. If the champions fight well they will be rewarded, but failure in battle may result in punishment from the gods. The first scenario is a battle of around 1500 points fought on a heavily wooded 4 x 4 table, which represents a chaos forest. 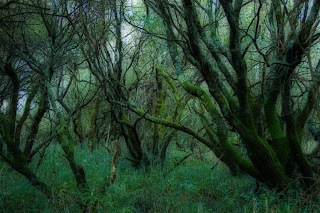 There should be a minimum of 8 woods, with paths (gaps) of about 6 inches between them, to allow some movement of troops. The two armies are each led by an exalted hero armed only with a hand weapon and shield, no magic items are allowed in this game, they have to be earned in battle! 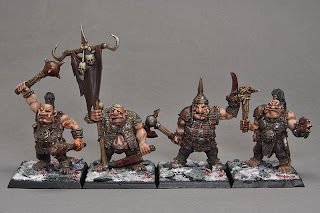 Additionally, troops should be marauders, warhounds and chaos warriors only, the champions do not yet have the renown to attract ogres, trolls or the like. 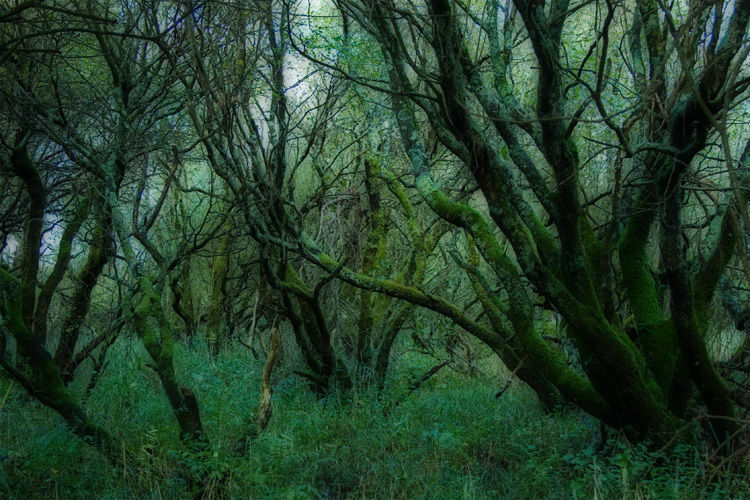 The exalted hero can search as many forests as he is able to in the game, subject to his army surviving the battle. However, he may only claim 50 points of items maximum, once this total is reached he must join the battle at the nearest available combat. Also, each forest can only be searched once per game. Other special rules. The exalted hero must challenge any unit champion he encounters in combat and gains an Eye of the Gods roll if he wins. End of Game. The game ends after 8 turns, or sooner if the champion and/or his army is destroyed. Victory is determined in the usual way, with an additional 100 victory points added for each magic item claimed. Each champion should also add 10 victory points for each unsaved wound they cause in the game. Once the victory points are added up, the champion's fate is decided. If the scores are within 100 victory points, the game is a draw and both champions retire intact but with no special reward. Any items found/rewards gained are carried over to the next game. If the difference in scores is more than 500 victory points, the loser is turned to spawn. The victor makes one roll on the Eye of the Gods table and he may choose to adjust his Eye roll by + or - 1. If the score difference is between 100 and 500 victory points, both champions retain their magic items for the next game. Any Eye of the Gods rewards gained by the loser are removed on a roll of 1 or 2. After building the chaos champion over the weekend, I wanted to finish painting his personal retinue. 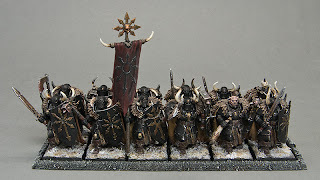 These warriors have been painted for several years, though originally they were garbed in a metallic armour. I have never really liked it, so decided to try black. 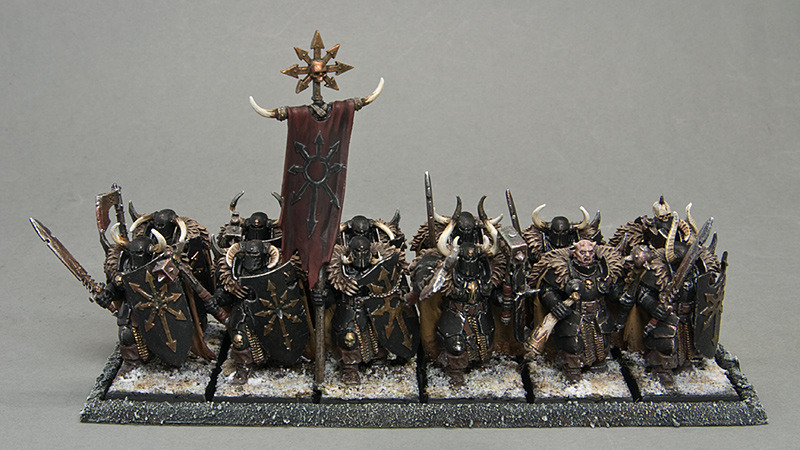 It seems to work quite well, especially with the snow bases and dark red of the cloaks and banner. I also tidied up the horns and a few other bits here and there. In total, I spent about 3 hours updating the old paint scheme, so it feels like I have completed a regiment in just half a day. If only all my figures could be so quickly transformed. A new champion emerges from the chaos wastes. No, not those chaos wastes of frozen tundra, plains of skulls and shattered mountains, but the chaotic shambles that is my pile of unpainted miniatures. Filled with resolutionary zeal (a common affliction in early January), I am keen to expand my chaos armies. This is the first of my efforts. And also my second.......but more on that in a future post. For the time being, this character will lead a small force into battle against a rival chaos aspiring champion. The two champions will be battling through an enchanted forest, hoping to earn gifts from the gods by their prowess in battle. There will also be the opportunity to find magic armour, weapons and the like during the game. It's all part of a Clash of Champions, a linked series of scenarios currently at the planning stage. I wanted to use a model that represents an exalted hero, with some flexibility on options. At the moment, he has a sword in hand, another at his waist and a shield. This will be adaptable for future scenarios. 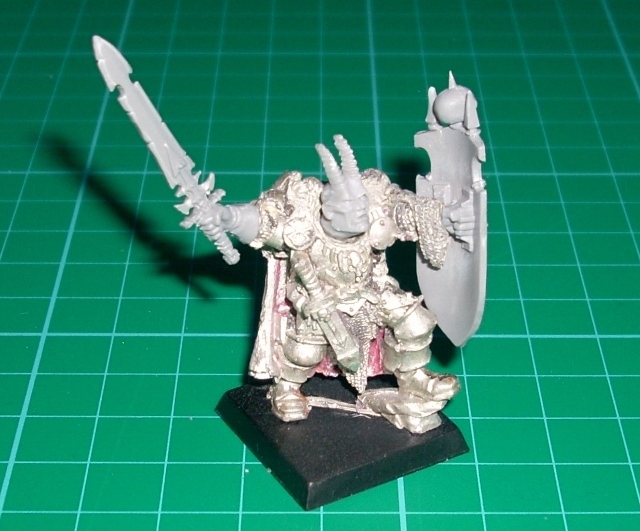 His army will be a personal retinue of the more common chaos denizens - marauders, hounds, warriors and maybe knights. He will begin the first game with no magic items or gifts. These will be earned/found during his battles. 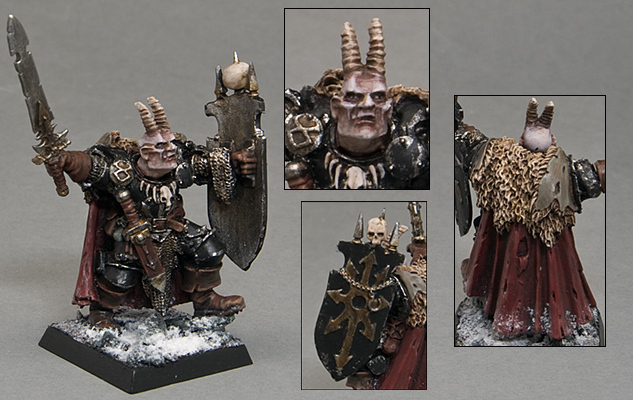 If he does well in battle, he may become an army standard bearer or chaos lord, or perhaps even better. If he fights badly, suffering defeat or fleeing from the fray, he may well be turned into a spawn. It's amazing how all this geeky planning has got me fired up about my chaos army again. This character and his personal retinue of warriors are the first on my list. It's been a while since I painted chaos, but their time has come again.